A 23 m CARBOCAT designed for use as a supply and service vessel for offshore wind farms. The first CarboCAT, the 23 m CarboClyde, has been in service at the Baltic 1 offshore wind farm of German energy supplier EnBW since mid-September. At a service speed of approximately 25 knots, it can transport up to eight tons of material and 12 to 24 technicians. Kockums is well known for building naval ships (including the Visby Class 'stealth' corvette) using carbon fibre composite and it has developed its own vacuum infusion process called KVASI (Kockums Vacuum Assisted Sandwich Infusion). 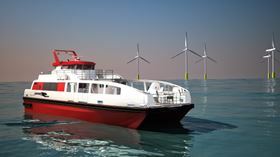 It is partnering with Fintry Marine Design AG of Switzerland on the development of a range of CarboCAT commercial catamarans of 18-23 m and 38-43 m which can be adapted to suit different purposes – from sea ambulances to large passenger ferries. Fintry Marine is responsible for marketing the CarboCAT range worldwide. The concept and outer appearance of the CarboClyde vessel came from Fintry and Kockums carried out the engineering and construction. high safety performance as a result of the composite sandwich construction and double bottom structure.